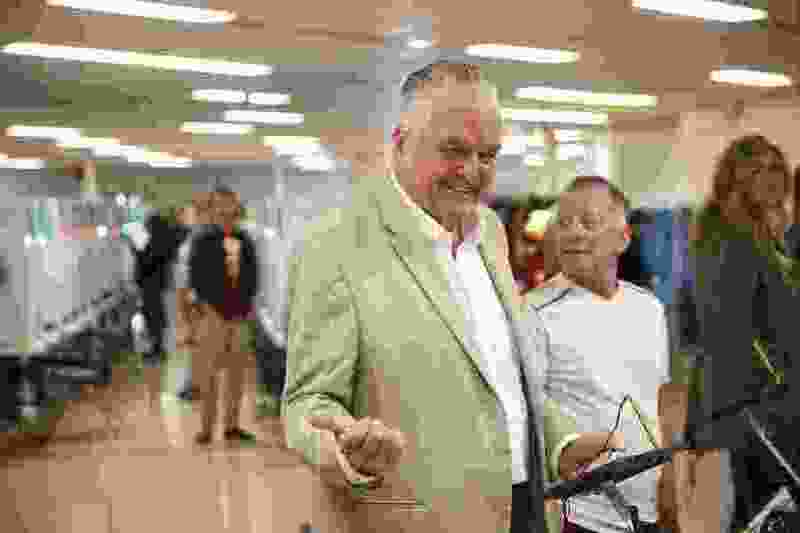 (Erik Verduzco | Las Vegas Review-Journal via AP) On Election Day, Nov. 6, 2018, Nevada Democratic gubernatorial candidate Steve Sisolak waits to cast his vote at a polling station at Kenny Guinn Middle School in Las Vegas. The governor-elect says his priorities are enacting tougher gun laws, expanding Medicare coverage and improving Nevada’s education system. Las Vegas • Nevada Gov.-elect Steve Sisolak, who will be the first Democrat in the post in two decades, said tougher gun laws are among his top priorities as he takes office in January. Sisolak said in an interview with The Associated Press that he wants to see the state ban assault weapons, silencers and bump stocks, which the gunman used in the 2017 Las Vegas mass shooting to modify his guns to mimic the firing of a fully automatic weapon. Fifty-eight people died and hundreds were wounded after a gambler-turned-gunman rained down bullets late Oct. 1, 2017, from the Mandalay Bay casino-resort into an outdoor concert crowd on the Las Vegas Strip. After the shooting, Sisolak started a fundraiser for the victims that amassed millions and cited the shooting on the campaign trail as a reason for change. He said he doesn’t have specifics of his gun-related proposals but said he isn’t advocating a buyback of those weapons and devices. In addition to those changes, Sisolak has said he wants to find a way to enact a 2016-voter-approved background check initiative that Republican Attorney General Adam Laxalt and GOP Gov. Brian Sandoval say was flawed and can't be enforced. Sisolak, who defeated Laxalt for governor by capturing 49 percent of the vote, is expected to find a smooth path for his agenda in the state Legislature, where Democrats increased their numbers and achieved a supermajority in the Assembly. But Sisolak said he’s not worried about whether the Democratic sweep gives him political capital to spend. “As long as they agree with what our agenda is and our mission and if they’re interested in doing what I am, which is helping the citizens of the state of Nevada ... we’re going to get along just fine. If they’re not, then we’re going to have a problem,” he said. Sisolak demurred when asked if the power shift will move the state further left. “I’m — I think — a moderate as it relates to some of these programs,” Sisolak said. Sisolak spent a decade on the Clark County Commission, the governing body overseeing the Las Vegas Strip and a county where most of the state’s population lives. Nevada Democrats next year could revive a plan to open the state’s Medicaid plan to anyone, regardless of need, instead of limiting the government subsidized-insurance to low-income residents. Sisolak said he doesn’t think the state has the resources to afford such a move, but wants it study it. On the death penalty, Sisolak says he is philosophically opposed to the death penalty and has no plans to try and ease the state's prolonged legal battle over the use lethal injection drugs. He said he wanted to talk with lawmakers before considering any steps to slow capital punishment. The governor-elect said another priority is improving the state’s education system, including finding more money for teacher pay. Sisolak will be inaugurated in Carson City on Jan. 7.